Terraza privada, balcón con vistas al mar. Wifi gratis. Este bonito estudio está situado en Port de Soller a pocos pasos de la playa de arena. La propiedad cuenta con una cama doble, cocina totalmente equipada, cuarto de baño, un comedor y una terraza privada con vistas al mar. Acceso WIFI gratuito. We stayed for a week in mid-October and were very impressed with the accommodation. Yes, it is up a very short steepish hill plus a dozen or so steps and both of us have some difficulty in our joints but we coped fine. So if you do have some mobility problems, it's more like a slow 5-6 minute walk to the beach, but really this is close to everything. There was some slight variation in the room from what was advertised, eg no microwave, but we wouldn't have used that anyway. There was a very useful island in the kitchen giving extra worktop and two stools. We loved having two balconies both with excellent views of the area. Each balcony had a table and two chairs, plus two sunbeds on the larger one. There was an enormous amount of cutlery, crockery, pots and pans for a two person place, but this suited us as we like cooking local food and eating in half the time, as well as trying the lovely and plentiful local bars and restaurants. Although the advertised check in is 4pm we arrived at 11:30am and were met by a lovely girl from the agency who manage the place on behalf of the owners, although we had emailed in advance to say we would be early. We didn't see much of the owners themselves but when we did they were friendly and the husband also checked on us when there was a problem with the electricity which only affected their house and not us! Overall we were really pleased with the accommodation, and would very happily stay here again. anzubringen, damit das Lampenlicht isoliert wird!!! Große Terrasse ist ein Bringer. We spent a great time at the cosy beach studio!!! The owner welcomed us, the are very kind and available!! The appartement is perfect for 2 people, cosy and well equipped! It has 1 private balcony and one private terrace where you can eat or rest! You can park the car just in front for free! The apartment is 2 minutes walking from the beach. The bay of Port de Sóller is magic, we loved it so much! Muchas gracias Maria y Manuel ! Min mand og jeg havde 9 dejlige overnatninger i denne skønne lejlighed.Der er alt hvad man har brug for.Også et meget veludstyret køkken.Det tager højest 2 minutter at gå ned til den fantastiske strand med det smukkeste vand.Vi var meget glade for at der ikke er aften sol på de to terrasser.Dette gjorde det behageligt både ude og inde i lejligheden.Udsigten er mindst ligeså god i virkeligheden som på billederne.Man kan som regl være heldig at parkere sin bil lige ude foran huset.Ellers er der en stor offentlig parkeringsplads tæt på.Er man til vandring,kan vi varmt anbefale både at vandre til Deia og Fornalutx.Vi giver lejligheden og ikke mindst beliggenheden vores bedste anbefalinger og kommer gerne igen. Loved Soller!! Great location very close to beach and restaurants ! We stayed at the Property July 2018. It’s in a great location very short walk down a steep Hill to the beach . Literally a minutes walk to the beach and nearest bar and restaurants. It was clean but a little dated . Would definitely say it was a studio apartment rather than a cottage . We were met by a young lady when we arrived then didn’t really see anybody throughout our stay . The owner lives next door . Nobody came in at all to clean but this was not a problem for us . There were clean towels and bedlinen in the drawer and we were able to Use the washing machine . We were Bit disappointed it was two single beds pushed together . The mattresses were comfortable but very light so it was quite easy to fall down in between the gap . Obviously it would be no problem if you are happy with two separate beds . I will probably say it was a three star . Bathroom was dated but didn’t bother us. Everything worked and the shower was adequate . The facilities were good they had thought of everything . If you are after a three star self catering studio apartment ,very close to beach and amenities then this is the perfect place for you . 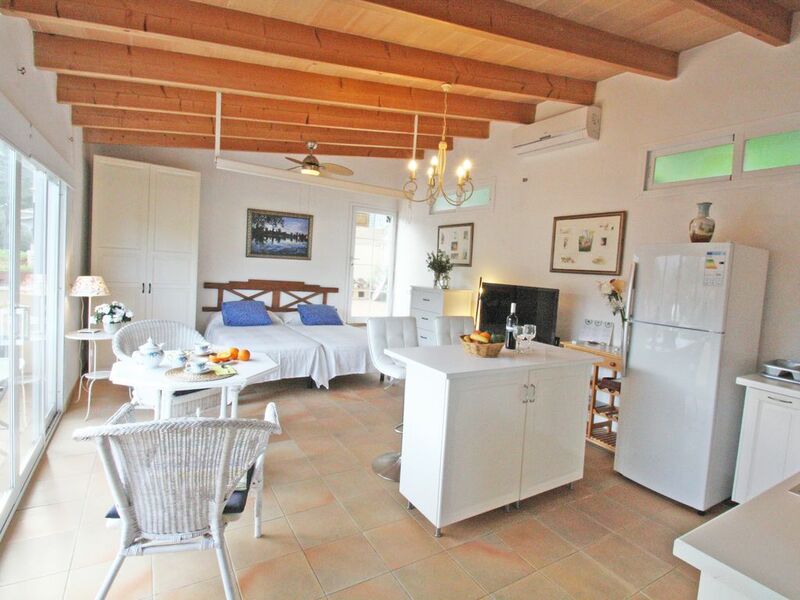 The location of the apartment is superb, close to the beach and with wonderful views over the bay. The apartment is well equipped and the pleasant surprise was the large side balcony and the spaciousness of the apartment itself. The owners were very welcoming and the only downside was an, as it turned out unfounded, degree of anxiety in advance over the balance of rental being demanded in cash on arrival. Puerto de Sóller es la única bahía natural en la costa noroeste de Mallorca, un recinto natural excepcional que merece la pena una visita. Antiguo barrio de pescadores de Santa Caterina conserva su carácter marinero. Puerto de Sóller combina la pesca con actividades recreativas, tales como la vela o disfrutar de la playa. A lo largo de la parte delantera hay muchas tiendas y restaurantes. Las dos playas, Ca'n Repic y generosidad Ca'n, los viajes en barco a Sa Calobra o Cala Tuent, el pescado fresco, un paseo hasta el faro, la puesta de sol desde el museo marítimo, el tranvía de Sóller, o simplemente el maravilloso puntos de vista que hacen que el puerto una visita obligada para los turistas, un verdadero lujo al alcance de todos! There is a final cleaning charge (50euros) for each booking. Balance payment must be made in cash on arrival. To confirm a booking we require a deposit paid by bank transfer. Check-in: from 14:00. Late arrivals (from 21:00) are subject to a €40 fee. Check-out: before 11:00. Early check-in / late check-out can be arranged, only if possible and upon request. These times need to be adhered to, to allow completion of cleaning & changeover.